What color hair bow will you choose? Maybe you'll select Shocking Pink or Lime Juice. Whatever your liking, you're certain to find just the right color ribbon here at O'Sew Pretty hair bows. O'Sew Pretty hair bows offers the largest selection of colors available, with over 100 solid grosgrain colors, and plenty of dots, stripes and novelty patterns including many of our own designs. Our grosgrain color charts not only display our wide variety of ribbon colors but also our thread colors used to personalize our Bow Dangles TM. Depending on the bow you select, you will be given the option to choose various ribbons styles, color and patterns that will make the finished product. So go ahead, express your child's personality, top off a beautiful outfit, or compliment her eyes with our huge selection of colored ribbon! "Mary is the queen of ribbon! My daughter has been wearing O' Sew Pretty hair bows for many years. We love them! Kelsey has really thick hair and if it wasn't for Mary, her hair would be in a rubber band everyday. We've never had a problem with any product that we've purchased from O' Sew Pretty, the bows last forever and Kelsey loves wearing them. We always buy bows for special occasions and holidays to match her dresses and we love giving them as gifts too.
" These bows are well worth the wait." 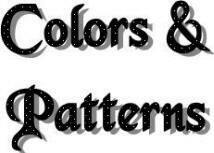 Fun patterns offered in an assortment of Checks and colors. Checks are a very durable and forgiving ribbon. This ribbon is sheer and very fluffy. It needs a little bit more care to stay looking fresh. Polka dot, pin dot and Swiss dot ribbon for making hair bows. 1/8" Satin ribbon used exclusively for our Curlies Collection of bows.